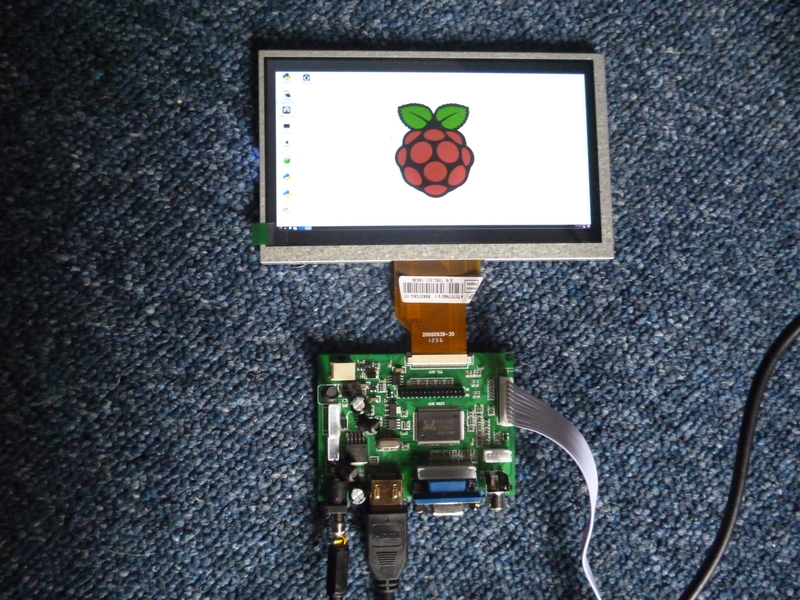 It is possible to buy a small, ie 7 inch, screen that can be used with a Raspberry Pi. Perhaps it is worth saying that this screen can be used on any system that produces a suitable output. What is strange about this product is that it is an incredible piece of technology yet come with virtually no documentation. However it is so simple to use that not much is needed. Here it is. It would seem that what is supplied is not always the same. Some videos on YouTube appear to have a remote control. The screen is 165mm by 100mm and 5mm thick. In use the image is 145mm by 75mm. The image is not symmetrically placed on the screen. The top boarder is 10mm and the left boarder is 8mm. The green tab on the bottom left is for pulling the protective layer off the screen. This is best left till the very end. 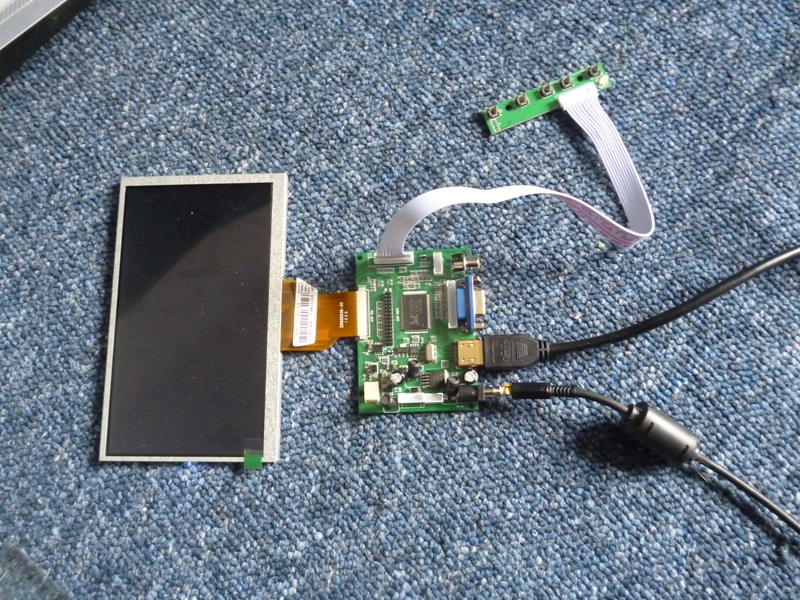 All of the connections to the screen are through the flexible pcb seen sticking out at the bottom. As shown here, the keypad is up side down. The controller is said to use 1-2A at 12V. It would seem that one would be stupid to use anything that did not supply at least 2A unless one had checked how much current this actually uses. This is supplied through the black 5.5mm connector at the bottom left hand corner. The outside is ground and the center is +12V. The key pad is connected to the board at the top of the right hand side. 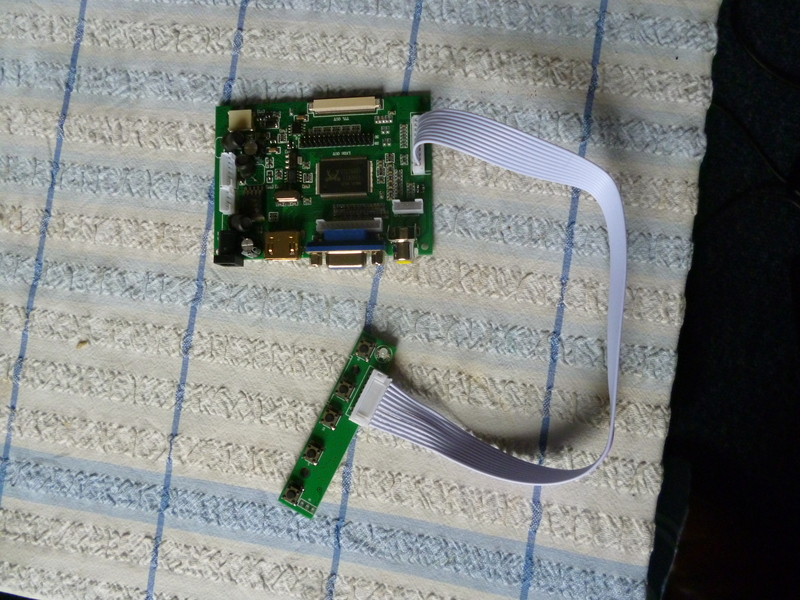 As supplied the connector will not fit in the socket. The socket has to be released by pulling the very small black tabs at either end of it out. 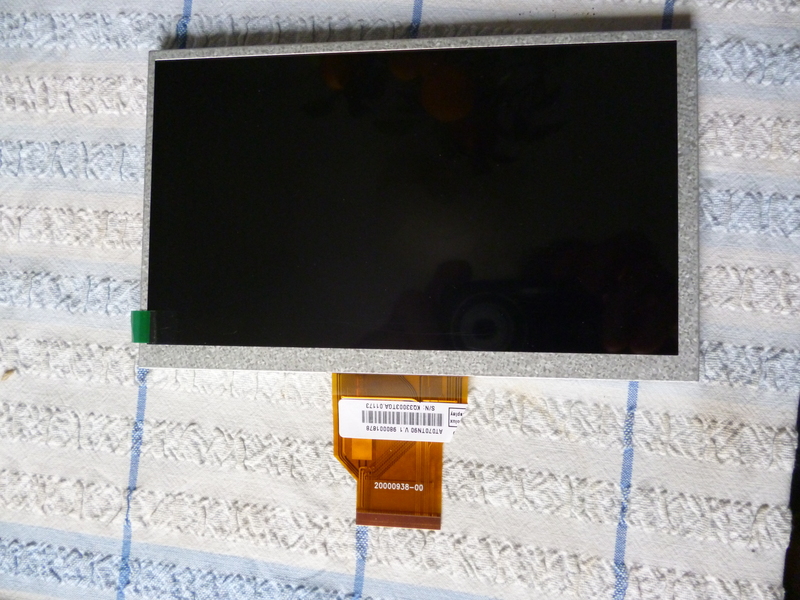 The flexible pcb from the display can them be pushed in. The tabs are then pushed back in and the connector will be locked in place. The edge of the “pins” on the connector must be parallel to the edge of the socket for this connection to be properly connected. When the power is turned on the led on the keypad will turn green. The bottom button on the keypad can be used to turn the controller on and off. When it is off the led on the keypad will turn red. If there is a signal it will be displayed. The display will show the image being sent scaled down to fit this display as can be seen above. With the first screen, the third button increases the brightness. In this case the second button reduces the brightness. In either the contrast or brightness states the first button will go back to the first screen. The fourth button opens up a whole series of windows relating to the display. If nothing is happening the controller will time out and turn the screen off. Furthermore even if the display is on whatever is driving it might time out. beige connector top left – not marked – power? This display is just a general purpose display. It does work with a Raspberry Pi because the Raspberry Pi has an HDMI output. There is no signal coming from the screen to the Raspberry PI so it has no idea whether there is a screen or not. It is almost impossible for this display not to work straight off with a Raspberry Pi.